As of late, I have found myself with “tired eyes.” I define this as an overall tiredness in the eyeball region caused by reading too much (usually on a screen) and an inability to focus due to stress and lack of money. Yesterday, I knew I had to get some writing done because my entire weekend was essentially blown and I hadn’t gotten any useful work accomplished. So, when Monday came around, I was gung ho. Armed with my laptop, I made the march to the library to get some good hours in but then it happened. We finally were having some lovely days in NYC. I sat upon a bench to take a break and read. The library is uphill. About twenty minutes in, I thought to myself: nope, I shall drop off this computer and go on a field trip. 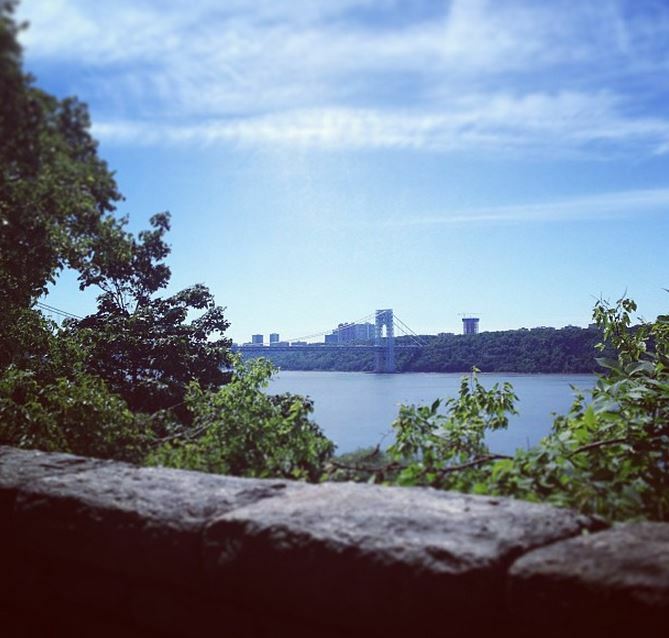 I took a lovely trip uptown to Fort Tryon Park. I found myself rested and when I awoke this morning, refocused (which was perfect). However, even with my Monday hooky, my fuzzy eye and unfocused brain has return at a breakneck speed. This has been happening lately and I would like to be rid of it. I am off now to take a lunch break and, perhaps, the weary writer will turn into the less alliterative focused and productive scribe. But for now I shall just look at this photo taken during my remedy for yesterday’s weary writer. You certainly picked a good place for a field trip. I was there a couple of years ago (visiting the Cloisters) and loved the views from the park. I hope you find yourself back into your writing. I want to believe that’s likely since I seem to be unfocused a bit lately too. I’m hoping! Today, I am trying a different library. I think the previous one had really improper lighting. It was way too fluorescent and the natural light mixed to make a terrible reflective nuisance on my laptop screen. One of our favorite places to rest our eyes and to “stretch” them too!